The annual Month of Photography, Tokyo will be held during May and June. Besides the Tokyo Metropolitan Museum of Photography, major photo galleries in Tokyo will hold a diverse array of photo exhibitions. Featuring young Japanese and Korean photographers. May 30-June 15, 10:00-18:00 (till 20:00 on Thu. & Fri.), closed Mon. Featuring young Korean college student photographers in Japan. Featuring winning works of PSJ’s annual photo awards. Winners include Brazilian Sebastiao Salgado, Etsuro Ishihara (Zeit Photo Salon), Guardian Garden, and Naoya Hatakeyama. Featuring photos submitted by 1,000 people. In April, it was announced that Ricoh will pull out of the film camera business after its current inventory of film cameras runs out. It has already stopped developing film cameras. With only a 1% market share in the film camera market dominated by Canon and Nikon, Ricoh will instead concentrate on digital cameras. So if there’s a Ricoh film camera that you’ve always wanted, better buy it now before it’s too late. An exhibit is an individual display of an art piece, etc., maybe in its own little corner of the gallery. Whereas an exhibition is a display of a collection of objects. Thus, an exhibition can consist of individual exhibits. Hailing from Montreal, Canada, Nathalie Daoust lived in Roppongi up until early 2003 and photographed foreign strippers working in nearby clubs. She has made the series using a lenticular technique which look like gif animations. Now she has opened a new Web site with her neat photos of these foreign strippers (called Tokyo Girls). I’ve been in touch with Nathalie during her stay in Tokyo and supported her activities. I even lent her my pole cats so she could build a photo studio in her tiny apt. I’m sure you’ll enjoy her artistic work and Web site. I can already hear everyone (who already has one) saying “Whoopee-doo,” but yes, I finally bought a digital camera several days ago at Yahoo! Japan Auctions. 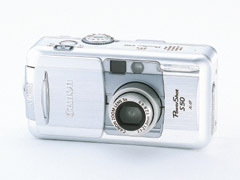 It’s a Canon PowerShot S50 with 5 megapixels. It currently sells for about 69,000 yen at major camera shops in Tokyo. But I luckily got mine brand new for 47,000 yen (the seller even paid for shipping and did not charge 5% tax). It seems to work well and it’s small enough to give to my baby sister when I get a better model about 6 months from now. Anyway, I’ll be using this digital camera to take sample pictures of photos inside photobooks. This means that you’ll be seeing a lot more sample photos in the book reviews (PhotoReviews). The photobook’s sample photos will no longer be the perfectly scanned images that I’ve been including. The images will be slightly distorted due to the page’s curvature, light reflections, etc. However, it will still be clear enough to see what the book’s pictures look like. This is better than not having any sample images, and it also makes it more difficult for anyone to use the images for undesirable purposes. I’ve always wanted to include more sample photos, but scanning books was such a chore. Can’t say if this camera will replace my point-and-shoot film camera that I always carry around. I’ll probably carry both for the time being. My main complaint is that compact digital cameras do not have a really wide-angle lens like 28mm (in 35mm-format terms). They all start from 35mm or 39mm or so. I often need the 28mm (I guess that’s when I’ll use my film camera). One thing I love about the S50 is that it can shoot movies with sound too. I’m sure I’ll use that feature a lot. 1. Startup time is somewhat slow. After turning on the camera, I have to wait a few seconds before I can take a picture. I was aware of this problem beforehand and thought it was a minor thing, but now I realize that it’s annoying. When I press the shutter button, the image is captured one or two moments later. The camera is definitely not for capturing the decisive moment or for action shots. 3. In daylight, the LCD screen is washed out. It’s great that you can see the image right after you take it, but outdoors during the day, the image on the LCD screen can be very hard to see. The screen needs a hood. 4. Red eye prone to occur with flash. This is a problem with most compact cameras. I wish it had a hot shoe for an external flash unit (like the Powershot G3). 5. Wide-angle at only 35mm. Wish it were 28mm (in 35mm format terms). I understand that most of the above problems are common among compact digital cameras. Although the camera is not as light or compact as my 28-105mm compact film camera, it’s still compact and light enough to carry around at all times. It’s a nice looking camera with nice silver finish (black in the States). So far, I usually carry both cameras. One thing I like is the ease of transferring images to my computer. I just connect the camera to my Mac (OS 10.2) and the images upload almost automatically. Usually I use Image Capture (included with OS X) and choose the images to transfer. It’s a breeze. The camera’s imaging software is also compatible with OS X (haven’t used it yet), while my late-model Epson printer’s digital imaging software is still not compatible with OS X. This is unforgivable. OS X has been around for 2 years and still non-compatibilty?? I still haven’t printed the images yet. That will be the next step and the true test. It’s been about a month since I started using my first digital camera. I’ve printed the photos with my new Epson PM-740DU printer and the results are very impressive. I now have no doubt that digital photography will surpass film photography in terms of market share and mass popularity. Kodak and FujiFilm got a lot to worry about. My new printer is Epson’s cheapest photo-quality printer which happens to be Epson’s second cheapest printer. The street price is about 15,000 yen. I’m using Epson’s glossy photo paper and printing in the photo-quality mode. The images are really photo quality, and you cannot tell that it was printed by an inkjet printer. I have to use a loupe to see the microscopic dots on the paper. I salute the printer manufacturers for finally developing true photo-quality printers that we can all buy at affordable prices and make our own prints. I’ve been printing the digital photos without any retouching, and yet the colors and overall image look great. The prints look like the images I see on my computer screen. 1. Epson says that I have to let the glossy prints dry for 24 hours. I can’t stack them right after printing so I have to lay out all the prints on the table or sofa to let them dry. (I wish I didn’t throw away my print drying rack when I had my B/W darkroom.) When I have over 200 L-size (9 cm x 13 cm) prints, they take up a lot of space. The ink is pretty dry and won’t smear right after printing, but I still have to let it dry for best results. 2. It takes about 4 min. to print out one L-size print. That’s only about 15 prints per hour. The top-of-the-line printer prints faster so getting a faster printer would be a solution. 3. I run out of color ink after printing about 100 L-size prints. (The black ink lasts longer.) One color ink cartridge costs about 1,000 yen. And a box of 100 L-size, glossy photo paper from Epson costs about 1,000 yen. So the cost is about 20 yen/print. It is about the same price of an L-size reprint from film. But I don’t have to pay for the film and development, so I do save money. Also, I can delete unwanted images, something that I can’t do with film. 4. Canon’s software does not allow me print borderless prints with my Epson printer. I have to use Epson’s printer software to do that. It seems that Canon’s camera software is geared for Canon printers, not surprisingly. 5. Borderless prints are great, but it crops out part of the image (as with film prints). When I want to print the entire image from edge to edge, I print it with borders instead. 6. I cannot print directly from the Canon camera while it is connected directly to the Epson printer. It’s not compatible it seems. Of course you can do it with a Canon printer. 7. Recording media is still quite expensive. My 256 MB CompactFlash card cost about 9,000 yen. A 516 MB CF card costs around 20,000 yen. There seems to be no cost advantage between the different recording media. SD cards, CF cards, and Memory Stick all seem to be priced the same for the same capacity. I hope someday soon these cards will become as cheap as CD-R or DVD-R discs. And I found out that the card is easy to lose. I already lost one 256 MB CF card during a recent trip. Fortunately, I had already uploaded all the images to my computer. The card should come in a case, but no. It only is protected by a small plastic bag. I need to put it in a good case that won’t get lost. 8. When you have digital photos, it’s a great temptation to just save the photos electronically on your hard disk or CD-ROM without making prints. But if you’re like me who likes to put photos in a real album, you should print out the photos each time you use the digital camera. Otherwise, it can take forever to print them later when you got thousands of images. The next thing I have to do is develop a system of organizing my digital photos. With film, I always assigned a roll No. to each roll of film. But with digital, there are no rolls so it’ll have to be a different system. Yes, digital photography is fun. So fun that I’m actually writing about it here. With inkjet printing technology coming of age, the time was right for me to switch over. Now I await cheaper digital SLR cameras and compact digital cameras with 28mm wide angle lenses. The current issue (May-June 2003) of PhotoStage magazine features a two-page article about PhotoGuide Japan and yours truly. The interview is in Japanese. It explains why I started the Web site and other details. This is a free magazine distributed at photo galleries in Tokyo such as the Nikon Salon in Ginza and Shinjuku. It provides photo exhibition schedules for photo galleries in the Tokyo area (including Yokohama and Kawasaki). US Ambassador Howard H. Baker, Jr. and Russian ambassador to Japan, Alexander N. Panov, will have a joint photo exhibition in Tokyo. They will show their photos of Japan. One-minute walk from JR Shinjuku Station’s East Exit. A few of their photos are also in the current (April) issue of Asahi Camera magazine. In case you didn’t know, Howard Baker is an avid photographer. This exhibition is the first comprehensive account of Japanese photography from its inception in the mid-nineteenth century to the present. Assembled by a team of distinguished Japanese and Western scholars, this groundbreaking exhibition establishes that photography began to play a vital role in Japanese culture soon after its introduction to Japan in the 1850s. The exhibition explores the medium’s evolution and aesthetic shifts in relation to Japan’s historical and cultural developments; the interaction of Japanese photographers with Western photographers; the link between photography and other Japanese art forms; and photography as a record and catalyst of change. The first Western survey of this rich and challenging history comprises more than 200 photographs, books, and magazines made between 1854 and 1998. Accompanying the exhibition is a groundbreaking catalogue copublished by the MFAH and Yale University Press. On view through April 27, 2003 at the Caroline Wiess Law Building, the Museum of Fine Arts, Houston (Texas, USA).